It is Hard to believe that it is already 2017! 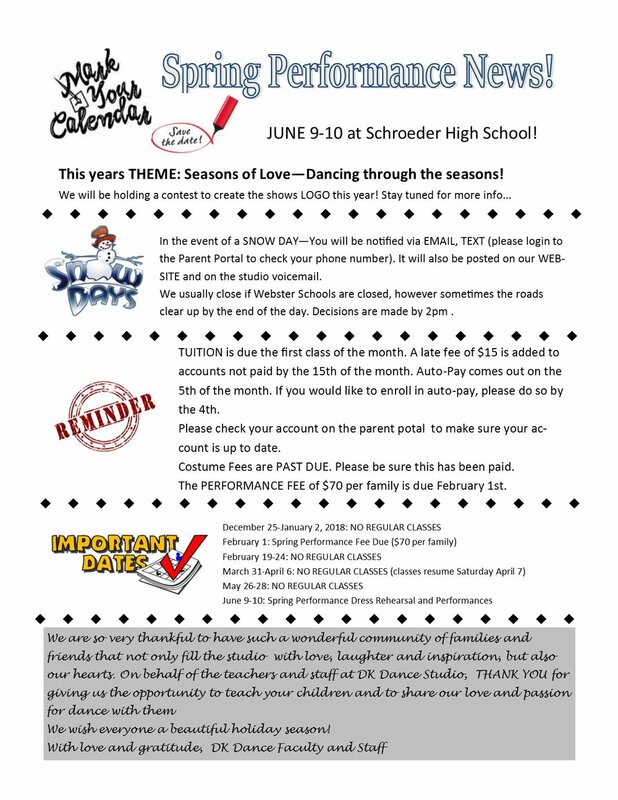 We will now be working a lot on our dances for the Spring Performance in June! We are so excited to get going on these! Check out the Spring Performance Page for more info on that. Just a reminder that the Spring Performance fee of $70 is due February 1st. Our classes are now closed for enrollment. We will have some fun day camps over February Break and April Break though, to stay tuned for that! It is hard to believe, but we are beginning to work on the SUMMER 2017 schedule, and will have that posted March 1st! If you have any suggestions for classes, please contact us! Good morning and Happy Fall!!! ** NEW 6 week 3 to 6 year old program called "ballerina princesses" will begin on Oct 4th! This is on Tuesdays from 5-5:45 . This is a fun class with a centralized theme while the dancers learn the basic principals of ballet and encourage their creativity in movement. 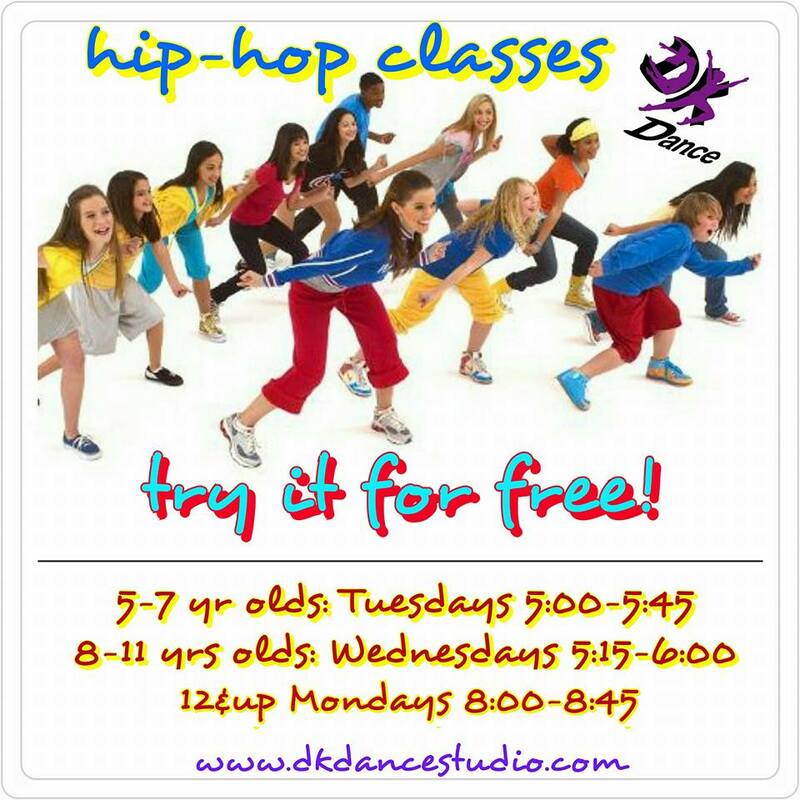 ** HIP-HOP for 7 to 11 yr olds! Our Monday night class is full, so we added a class on Wednesdays from 5:15-6:00. This is such a FUN, upbeat class!!! ** HIPHOP for 4 to 6 year olds.....oh, what fun!!! TUESDAYS 5:00-5:45...these boys and girls have been having a blast! **HIPHOP for teens.....Mondays 8:00-8:45! These girls have been having a lot of fun. A great way to add some physical movement to the teens schedule! **TINIEST Dancers (2 year olds! ): Saturday mornings 8:30-9:15! We also have room in our Thursday night Young Dancer (8 to 11 yr old) ballet tap and jazz classes & Mondays Mini dancers (6.5-8 yr old ballet, tap and jazz). Is your dancer Playing a fall sport/ activity and classes don't work in the schedule right now?? That's ok, give us a call and we can hold a spot for your dancer!!! But do that quick, as classes are filling up. As always, we offer FREE TRIAL classes for those who want to test it out first. Referral program: if our currently registered students refer a friend to dance, you will get a $10 credit towards the account. (The newly registered, referred student muse be registered for 3 months prior to applying the credit). Lastly, check out the the Webster Rec Center's DANCE schedule ....as we are also offering 5 week session classes there!! With the first week of classes under our belts, and heading into week 2, I just wanted to update you on what is going on in the classes. We have been able to speak with someone of the classes, but not all. We are so excited about how we are developing the dance programs for these dancers this year and would love your involvement, also. Even though this is an "extra curricular activity", it is still an important place to learn....in a FUN way! So we aim to keep you up to date with what we are doing in class, in hopes that you can be a little involved. Even if it is just knowing a little of what we are doing for "after dance class conversation on the car ride home" or bringing it up a couple days after class. The kids all did WONDERFUL with it all week! We are working with THEMES in our Tiny and Little Dancers classes, which we will follow for 4 week periods. The first theme we are working with is BARNYARD. The dancers all have a sticker chart, that we are keeping in the classroom. On this sticker chart are different movements that the dancers will learn, and once they do, they earn their sticker! It is our goal to get through these movements in the 4 week time frame. Once they fill up their sticker chart, they will get to take it home and then get a new one with the new theme. With the BARNYARD THEME....we are talking a lot about ...you guessed it...ANIMALS! With animals, comes movement. Mostly all the dance steps and movements we are doing, although technical dance steps, resemble movements of animals. It is awesome to see how quickly the dancers are connecting the movements. We have taught them the "Bee Hive" song, which is SO fun. We will be including the book BARNYARD DANCE! by Sandra Boynton in the classes as well, which also has a song that pairs with it and is SO FUN! This is such a fun THEME and we are so excited to experience this with the dancers. They are responding so great to it!!! Miss Dena, Miss Lauren, and Miss Morgan! WHY CHOOSE DK DANCE STUDIO FOR YOUR CHILD? I am always happy to hear of children taking dance class, because I think it is such a wonderful thing. Dance opens up doors and helps carve the pathways of development in ways that other activities cannot. It is something I grew up loving and am still just as in love dance. So, if you have a dancer that dances...that is awesome! Keep on dancing! I am going to do a little DK Dance Studio promoting though, because I am SO proud of what we offer. Our classes are FUN but we teach a ton, too! 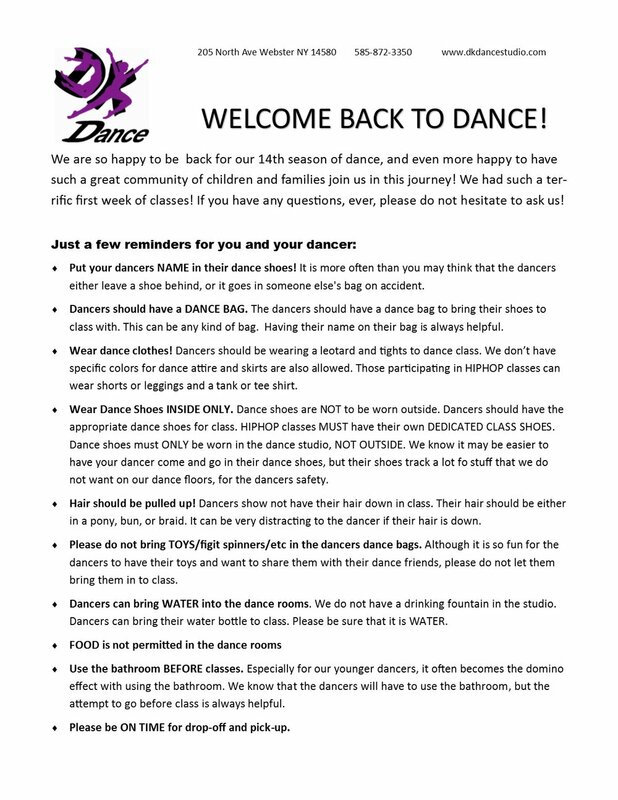 A lot of times, people may be hesitant to sign their child up for dance, in fear that it is like that particular popular dance show on Lifetime, filled with drama and sass and more drama...We do not condone that kind of drama...we encourage positive experiences, with positive interactions. We have SO MUCH FUN in classes but with that fun, the dancers learn a ton! We are so proud of our dance instructors backgrounds and education, and what the dancers learn in class! They, of course, are learning dance steps....but beyond that they are learning vocabulary, social skills, history, behavior skills, problem solving, teamwork and SO much more! AND IT IS FUN! DK Dance is a place to GROW! From the young age of 2, to graduating from High School, we have a class for everyone! We pride ourselves on the strength of our recreational classes, with emphasis on wonderful material and education, while having FUN. We have the option for those who want more of a challenge in dance, with more performance opportunity, to join the Performance Team. But if they do not want to do that, they do not have to! We still have wonderful classes for them, and believe they are just as an important part of our dance community than anyone else! So, when you have a dancer starting to dance at the budding age of 2, or 1st grade or even middle school....there is a place for them at DK Dance and also a place to grow! We do not have a class of 20-25, 3 and 4 year olds, we have classes of 10-11. We do not have a class of 20 , 10 year olds....we have a class of 10-12. WHAT the dancers learn is so important to us, not how many dancers are in a class. 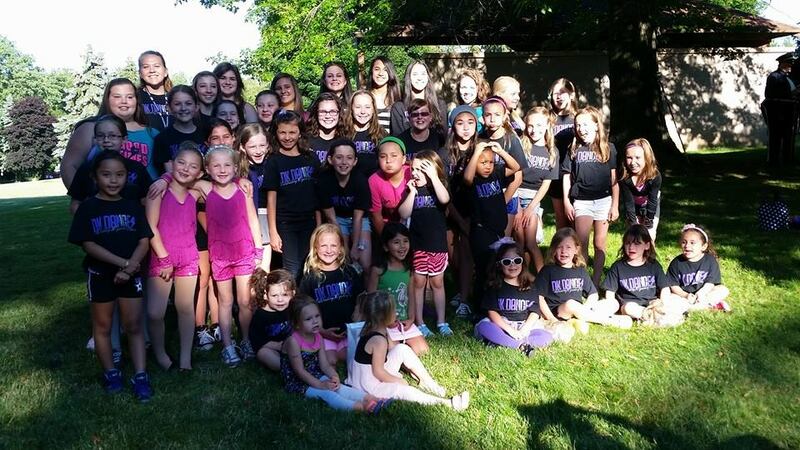 We LOVE our smaller class sizes, and take tremendous PRIDE in them because we know the dancers are getting more attention from the teacher, and we love how personable we can be with the dancers, and their family! When I opened DK Dance in 2004, I opened it with a purpose - to SHARE my PASSION and LOVE for dance to as many as I could. Dance has brought me so many wonderful things in my life, including experiences, friends, family, amazing memories, and so much more! I am SO proud of the faculty I have, because they all have the same view. We are all here to educate the dancers and to push them to their best abilities, but to also create a positive and wonderful experience that will remain with them a lifetime! We truly CARE about your child! When you come to DK Dance, we are truly invested in your child and what they are learning. We care about every student we have, and love the relationships we build. We want to be positive role models and positive influences in their growing lives. As I am writing this, I am thinking back on this summer specifically. I am thinking of some young dancers in a 4 week hip-hop class who came in not knowing anyone, being so quiet and shy, and finishing that 4 weeks filled with energy and new friends! Then there were some new little toddler dancers who cried at the mere thought of leaving their mommy to come into class, and ended up in the room full of smiles with a little taste of independence. And our dancers who danced in our Intensive Week, many who have been dancing since they were like 3...supporting one another, rooting each other on, enjoying time spent and working SO HARD. Not to mention, how RESPECTFUL they are to their teachers, guests teachers, and each other. We are so PROUD. I can also add, that I am SO adamant about maintaining the young dancers MODESTY. AGE APPROPRIATE dress and movement is a MUST. I have 2 growing girls ...I know how you feel! So, if you are going back and forth, wondering WHERE your child should dance, I might be a little bias, but I can tell you that my daughters will be dancing at DK Dance! We will always offer a free trial class to see if it is the right fit for you and your dancer. Just contact us and we can arrange that for you. We hope to see you at DK Dance Studio! May all your days be dancing ones! Visit us at one of our Open Houses!!! We are excited to march again in the Webster Fireman's Parade on Thursday July 14! This is always a fun time, and the more dancers and families we have, the better! We will have updated info as we get it, but we normally line up on Philips Rd around 5-5:30. The parade begins at 6. We hope you can join us! Dancers are encouraged to wear their costumes, or their Spring Performance Shirt! Dancing Through the Decades! a Success! What a wonderful couple of shows we had!!! We are so proud of our dancers! A year of hard work and dedication....put together int0 2, 2.5 hour shows! They were spectacular. Thank you to teachers for their efforts and constant positive reinforcement. We are so thankful to have wonderful families at DK Dance, that make our DK Dance community a wonderful family! Thank you for all of the cards, gifts, flowers, hugs, and positive words! It was quite overwhelming! We cannot wait for next year!!! !